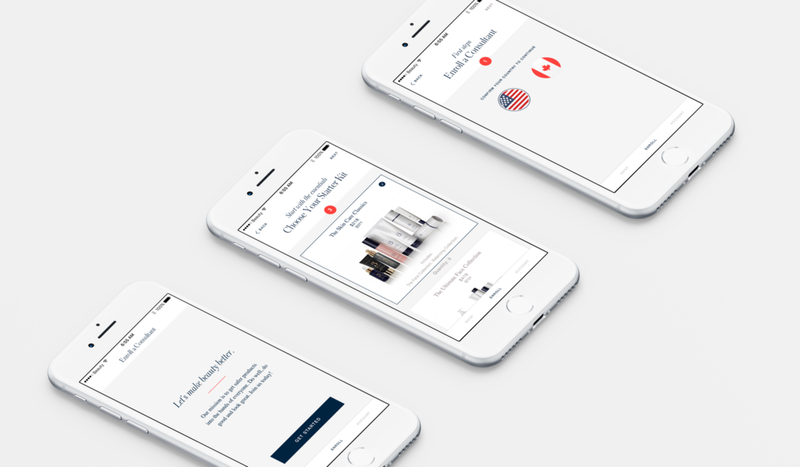 Prolific teamed up with Beautycounter to build their first app to support the businesses of thousands of Beautycounter consultants nationwide. Beautycounter is a direct sales beauty company with a mission: get safer products into the hands of everyone. They empower their consultants to spread their mission and share safe products. 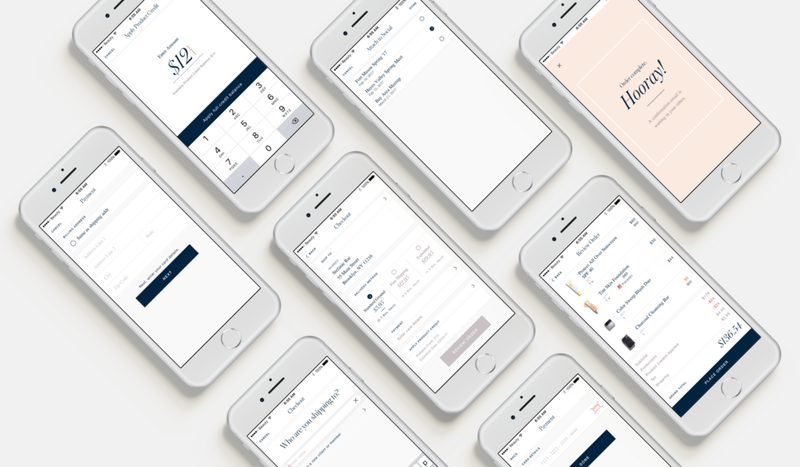 Our goal was to create an tool that fit into busy schedules for Beautycounter consultants to run their businesses by helping them increase their sales on the go. Our team created an app that allowed consultants to sell their products from their mobile phones, manage their client list and past orders, provide a best in class sales experience, and enroll new team members. I led UX for the discovery strategy project as well as the build project. Additionally, I owned the App Store Optimization and copywriting. The team was comprised of another designer, a product manager and two developers. The timeline for this project was four months. We're live in the App Store! We kicked of the engagement with a one month discovery project where we conducted stakeholder interviews, consultant interviews and concept testing to create business, user and app goals. We used an affinity diagramming exercise, with stakeholders, using direct quotes from consultants to come up with high level themes and usability trends. I created personas and user journey maps to determine the most important pain points to tackle. Each week we conducted user interviews with consultants, using open ended, concept driven questions and a think aloud process. In total we tested 6 prototypes throughout the month discovery. During initial discovery testing we learned which areas of the app we proposed were most vital and impactful for consultants. We used this data to narrow down the MVP to four tabs: Shop, Clients, Account, Enroll (business- need add on). With our MVP features set we're off to build! User journey map created after a week of stakeholder, user interviews and affinity diagramming. 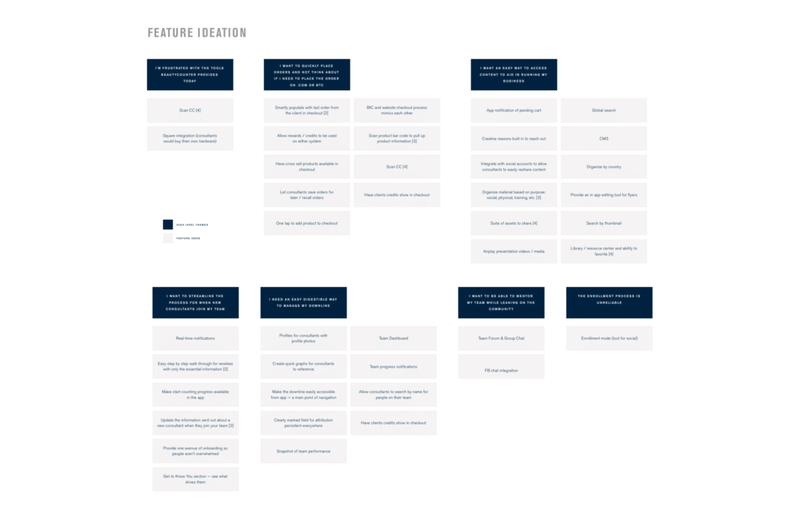 This was used to help our team and Beautycounter align on specific priorities for the MVP. Output of affinity mapping and collaborative ideation sessions to surface themes and key paint points. These future vision wireframes outline the ideal state app. Using the main themes and features that came up in affinity mapping we developed 5 tabs. Consultants need a way to efficiently order from their vast catalogue for their customers. Consultants often make sales and connect with people while they're out socializing, at parties, or at their children's sporting events. Currently they can only place orders through a cumbersome online system that only works on their desktop computer. Many consultants carry around paper order forms to take orders while they're out and about. User Goal: As a consultant, I want a way to streamline order placement, so that I can feel proud about Beautycounter and build my client base. We designed a product catalogue and order flow that is optimized for efficiency. The Quick Add button allows consultants to add to cart without diving into each product that they already know by heart. This swiping left/right navigation system was heavily tested with consultants to ensure it worked for their particular use case. Consultants can quickly find the products their customers are looking for in the catalogue. Quick Add lets consultants add to their cart quickly, without having to view product details. Consultants have to consider a lot in checkout. They indicate which social event the items were purchased from, apply customer promotional credit, and ship to both the US and Canada. We created a checkout flow that allowed consultants to quickly tap in and out to account for all the information they need to edit and view their whole order in one scan. Consultants add new members to their team through a cumbersome desktop system that often fails. It leaves a negative first impression of the Beautycounter company and is demoralizing to the consultants. Beautycounter wanted a simple way to enroll new team members on the app. Our solution provides a simple step by step flow, navigating through important decision points and collecting personal information. Consultants want all of their clients information at their fingertips, so they can follow up with them in a meaningful way while increasing their sales. We designed a client management tab for consultants to quickly reference their client list, view their past orders. User flow shared with developers and stakeholders to align on a structure for the shopping tap. One UX digest deliverable on navigation user testing. Shared with Beautycounter weekly to stay involved in our research and learnings. After the MVP release, we planned a diary study to asses how the app is being used and craft the next feature set.